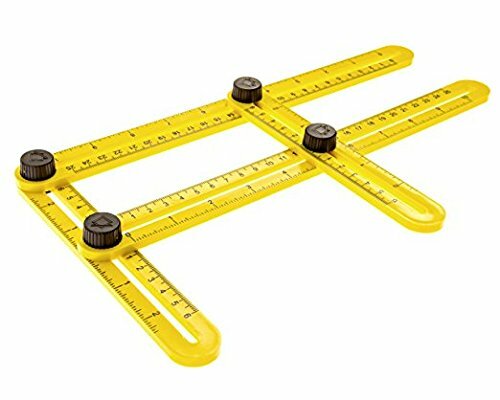 Durable ABS plastic and lightweight angle ruler is perfect for any person looking to work smarter on any job site. The unlimited applications and easy use make it a must have for any handyman. Create outlines and stencils of any shape or angle on any material to get work done easier and stress free! PERFECT TEMPLATE TOOL: Great for builders, craftsmen and any average handymen who need precision and consistency in their work. An absolute must for any toolbox whose limits are only that of the users imagination! ANGLED CUTS EVERY TIME: The rulers four sides slide and lock to any desired angle giving you the perfect re-usable template for any application. MULTI-USE: The template has a practical application for almost any form of work including brick, metal, wood, tile and even for the artists out there looking to find the perfect angles and shapes for their craft. DURABLE: Made from a strong ABS plastic used in power tool gear housing, keyboards and some dashboards, the ruler will survive wear and tear from many projects. The lightweight, tough material makes the template easy to carry to any job site! GUARANTEED: We here at AG3 Sales care about our customers and offer a 100% money back guarantee if you are unsatisfied with our product!